OK, let’s get the obvious question out of the way: No, this drink was not named in honor of Queen Elizabeth II. Rather, it was named for the creator’s wife. But more history later. What you need to know now is that, despite the drink’s majestic moniker, it’s simplicity itself to make. 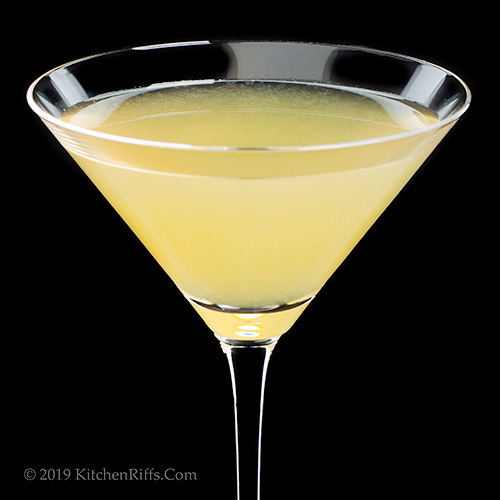 The Queen Elizabeth cocktail requires only three ingredients: Dry vermouth, Bénédictine liqueur, and lime juice. And because this drink doesn’t contain a base spirit, its alcohol quotient is quite modest. So low alcohol, but lofty flavor. Make a round of these and you’ll rule. The origins of most cocktails are rather uncertain. Not so with this drink: It was invented in 1934 by Herbert L. Quick, the head bartender at the Benjamin Franklin Hotel in Philadelphia. Quick created it as an entry for a nationwide cocktail contest sponsored by the folks who marketed Bénédictine liqueur. Every cocktail needs a name, so Quick named this one after his wife. At that time, there was no Queen Elizabeth in sight. The mother of the current queen (also named Elizabeth) only took that title when her husband became king in 1936, after the abdication of his brother. The reign of Elizabeth II was many years in the future. (She ascended the throne in 1952.) And Elizabeth I had died in 1603. We discovered this drink in an article by cocktail historian extraordinaire David Wondrich. This recipe takes about 5 minutes to prepare and serves one. Place all ingredients (except garnish) in a cocktail shaker half filled with ice. Shake briskly for 20 to 30 seconds, until the contents are icy cold. Strain into a cocktail glass or coupe, preferably one that has been chilled. Garnish if you wish (we usually don’t), and serve. This cocktail is a bit on the sweet side. It works as a predinner drink if you serve it with something salty. It’s also good after dinner as a digestif. Or drink this all by itself as an afternoon sipper. 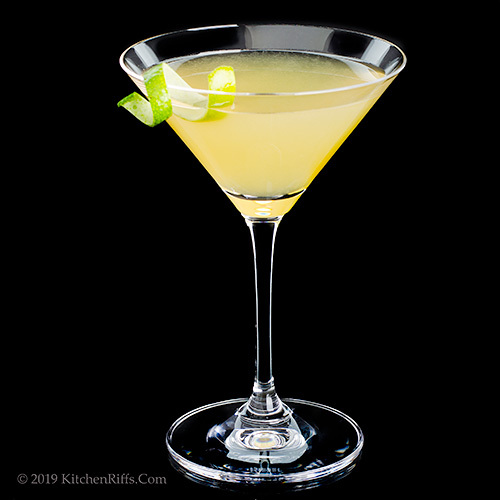 There are at least two other drinks called the “Queen Elizabeth” that have different ingredients from this one. We’re aware of one that is gin based and another that is brandy based. We don’t find either to be particularly good, and we don’t recommend them. If you want to try these imposter cocktails, though, you can find recipes for them in The Savoy Cocktail Book. Or search the interwebs. 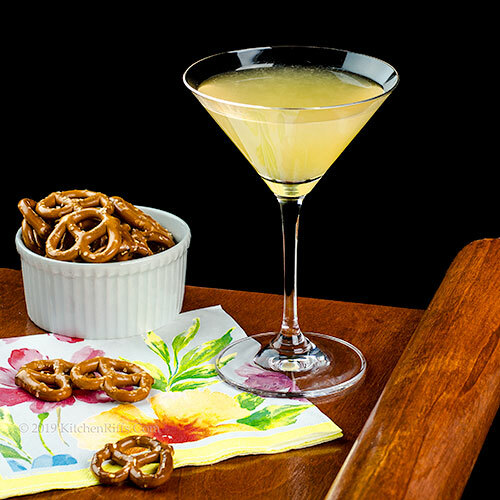 The flavor of dry vermouth is important in this drink, so use good-quality stuff. Our favorite brands are Noilly Prat, Martini and Rossi, and Dolin. If in doubt, ask the friendly folks at your local liquor store for a recommendation. BTW, vermouth has a low alcohol level, so it starts oxidizing once you open the bottle. To delay its decline, refrigerate vermouth after opening. Bénédictine is an aromatic herbal liqueur that’s somewhat on the sweet side. Given its name, you might assume it’s made by Benedictine monks. In fact, it was invented by Alexandre Le Grand, a French industrialist and wine merchant, in 1863. Le Grand was a master marketer, though, so he claimed it had been developed at a Benedictine Abbey in Normandy. Although this cocktail has nothing to do with Queen Ellizabeth II, Britain’s monarch does enjoy a drink. Her favorite is the Dubonnet Cocktail, a classy mixture of Dubonnet and gin (her mother also favored this drink). The queen also reportedly enjoys dry martinis, wine, and champagne (she is said to have a glass of bubbly every evening). “I only fix you right royal cocktails,” I said. “That’d be a royal pain,” I said. Mrs K R’s motto: It’s good to be queen. Good jokes this week. The Queen Mum (Elizabeth's mum, that is) had quite a taste for alcohol according to what I read. I wonder if there are any cocktails named for her. YUm! It looks so pretty. I've never had Bénédictine before. Hi Mae, haven't heard of any cocktails being named after the Queen Mum -- I should look. There are reports that the current queen consumes 4 drinks a day, although the accuracy of that seems in doubt (one learns so much doing research!). Thanks for the comment. Hi Pam, Bénédictine is wonderful in cocktails! Not a huge fan of it by itself, but it adds a lot to many cocktails. Thanks for the comment. I like this even more because of the history of its name. Such a cute story! Hi Kelsie, isn't the history of this one fun? Flavor is fun, too. :-) Thanks for the comment. I need you to be my own personal bartender haha! Love reading the history behind this cocktail. Hi Ashley, cocktail history is fascinating, isn't it? Thanks for the comment. Hi Juliana, you can always pretend that it does! :-) Thanks for the comment. Hi Bobbi, Bénédictine is somewhat sweet and has a definite herbal taste. Kinda sorta like a brandy-based vermouth. Kinda. Sorta. :-) Thanks for the comment. Hi Anne, I'm sure TheHub will pay you proper homage. If he knows what's good for him. :-) Thanks for the comment. I've never had Bénédictine before. The cocktail looks pretty and I bet it's very tasty too, John. Hi Angie, very tasty. :-) Thanks for the comment. I love this cocktail and now I have to get the ingredients. Prost! With a given name of Elizabeth, I think this is a must try cocktail. It sounds lovely!! Hi Sherry, Bénédictine is herbal in the sense that vermouth is herbal But if you don't like vermouth, you won't like Bénédictine! :-) Thanks for the comment. Hi Gelinde, you DO have to get the ingredients. :-) Thanks for the comment. HI Liz, this cocktail is definitely for you! :-) Thanks for the comment. A very interesting cocktail story. I've not tasted this one, but I will order one next time I'm at the English pub and see what I get. Thanks for the history info. Hi Ron, I'll be curious to see what you get, too! There ARE those two other cocktails with the same name out there, so that's what you might get. Better bring the recipe for this one with you in case the bartender doesn't know it. :-) Thanks for the comment. Dry vermouth and Bénédictine, how interesting, I think I would rather enjoy that. I wonder if the real Queen has tried it. Lucky girl! Hi Evelyne, good question regarding where QEII has tried this! Bet she's tried the gin version (because she definitely likes gin; although we think this version is better). Thanks for the comment. Almost looks like a refreshing glass of lemonade! I'll have to wait until I'm off my low-carb diet to have this drink- something to look forward to! Hi Fran, this actually tastes a bit like not-too-sweet limeade. :-) Thanks for the comment. John, a "low-alcohol charmer" might well describe me! :D Maybe I should give it a try. I've never been fond of sweet drinks, but I could have it for dessert, right? Hi Jean, this would be excellent for dessert! :-) Thanks for the comment. Hi Natalia, doesn't it? Tasty, too. :-) Thanks for the comment. Easter brunch is in the planning stages. I think serving Queen Elizabeth's should be added to the drink menu! Hi Deb, this would make a terrific brunch drink! Thanks for the comment. Love that he named this drink after his wife. Hopefully he actually loved the drink and drank it daily - haha! I think even I -- (the non-mixologist -- can handle this one! 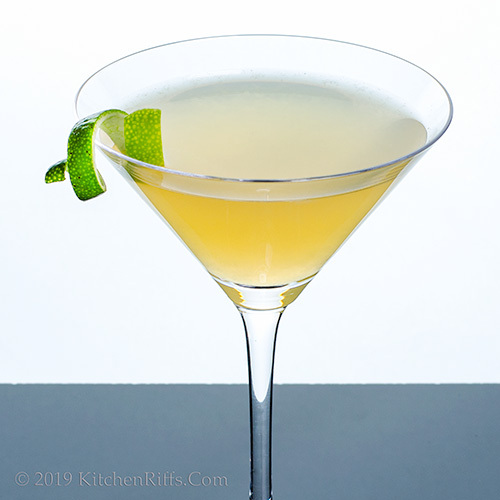 ;-) I love vermouth and lime -- sounds delicious! Your cocktail photos are always exquisite! Hi GiGi, well, maybe not daily, but surely several times a week. :-) Thanks for the comment. Hi Valentina, drinks are pretty easy to mix once you get a handle on how to do it. Basically dump everything in a shaker and shake until chilled! :-) Thanks for the comment. I have been considering trying Benedictine for quite some time. Now that I know it has your seal of approval, I can't go wrong. Hi Laura, always worth a try! And it's such a nice flavor in cocktails. :-) Thanks for the comment. Queen or no Queen, this sounds delightful and I like the low alcohol content - means you can drink more of them! Hi David, yup, being able to drink more than two of these is definitely an advantage! :-) Thanks for the comment. This sounds so refreshing John - and so pretty. Royalty or not - I like it! Hi Tricia, we're all royalty when we drink this! :-) Thanks for the comment. Hi Carolyn, fun idea! :-) Thanks for the comment. That's a clever cocktail name -pretty sophisticated, huh!. Hi Balvinder, fun name, isn't it? Fun drink, too! :-) Thanks for the comment. A majestic drink for a majestic lady, Benedictine is fabulous and really not used enough at all. The addition of pretzels just tops off this fabulous concoction. Very nice cocktail. Love that it's lower in alcohol as I'm having to reduce my consumption. Love anything with lime! Thanks John! Hi Merryn, wonderful flavor in this! And the salty pretzels really do go nicely with it. :-) Thanks for the comment. Hi MJ, we all need a lower alcohol drink from time to time. :-) This is a good one -- think you'll like its flavor. Thanks for the comment. I love when you post drinks I've never heard of before! Especially when they contain something I love, like Benedictine. It seems so off the beaten path any more. Hi Jeff, Bénédictine really isn't as popular as it should be in cocktails -- it's a wonderful ingredient. Of course people still drink it mixed with brandy (B&B) as an after dinner drink -- probably the most popular use of it. Thanks for the comment. I love the thought of this as an afternoon sipper. And, I love lime juice. I'd love to have one or two while sitting outside before dinner! That looks good and the pictures are beautiful! Hi Lisa, this is a wonderful slow sipper -- very refreshing. :-) Thanks for the comment. Hi Taruna, it IS good! :-) Thanks for the comment. What a perfectly lovely cocktail, I would love one of these pre-dinner. Hi Emma, it's such a nice drink -- very refreshing. Thanks for the comment. Since I'm the queen of the house, I think this cocktail would suit me perfectly. And I have the ingredients so let's get this party started! Hi Abbe, basically that's Mrs KR's take on this. :-) Thanks for the comment. Hi M&E, 3 ingredients, big flavor. :-) Thanks for the comment. This is indeed a regal drink - I would never have thought it only needed 3 ingredients! Thanks so much for sharing it! Hi Shashi, a lot of drinks have only a few ingredients. It's how you combine them that counts. :-) Thanks for the comment. Hi Greg, yup, I could see that too! :-) Thanks for the comment.